In Logamba, Superman works alone to resolve the conflict. After preventing needless deaths in the capital city, the Man of Steel captures the leaders of both sides and forces them to come to peace. Over in Metropolis, the Daily Planet gang continues to search for Jon. Using Jimmy's signal watch, Lois sends out a distress signal for Clark. Meanwhile, Jor-El explains to Jon that Earth is an unsuitable place for his family to live. According to Jor-El, a threat is coming to their plane of reality that not even the Justice League can defeat. Hearing the signal from Jimmy's watch, Jor-El decides that the time has come to return Jon. Back in Logamba, Superman destroys the weapons of both the government and the rebels before flying off back to Metropolis. In an unidentified building, a group of Oz's followers prepare to launch a chemical attack on the city of Metropolis sparked by the failure of the bomber from last issue. Superman breaks up the party and foils their plan. During the bust, the Man of Tomorrow discovers that Jor-El has been responsible for the utter madness that has been occurring all over the globe. Superman makes his way to the Daily Planet to find Lois. Jor-El and Jon soon arrive. Words are exchanged regarding the imminent danger, the cruelty of man, and Jor-El's elimination of a few of his son's enemies. Superman moves to punch his father. Much to his surprise, Jon intercepts the punch and warns his father that danger is coming. Story - 4: Now we're getting somewhere. If you've read my past reviews for this story, you'll know that I've been finding this arc to be a bit slow. Good, but a bit slow. With this issue, things start to move along. There are enough little drops of information that spark interest in future issues. I'm curious about this imminent danger. I'm certain that it has something to do with The Doomsday Clock, but the build-up of the threat makes me eager to know what exactly our favorite heroes will be up against. I thoroughly appreciate how every issue of Action during the Rebirth era actually matters. There are plenty of callbacks to events of previous issues, including a couple very small details from the beginning of the relaunch. The one that comes most to mind is when Superman realizes that the gang about to poison Metropolis wear the same clothes as the group that came to capture Doomsday in the first Rebirth arc for Action. It's small details like this that went initially unnoticed, but come to have quite a bit of significance. That means that this arc has been planned from the beginning. This also means that every story leading up to The Doomsday Clock was planned and they were planned company-wide. As a fan of clear universe continuity, this makes me happy because that means DC is putting in a serious effort to make sure that actions have repercussions. 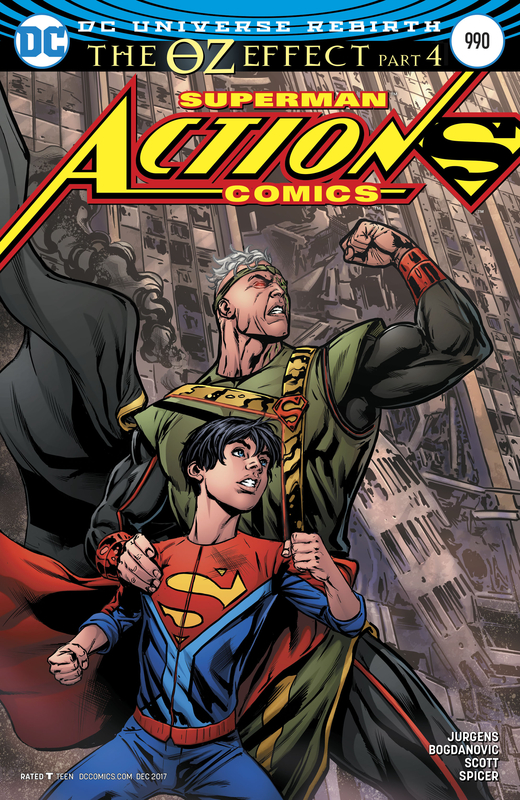 Aside from Superman stopping some atrocities and Jor-El coaxing Jon to join him, not much else happens in this issue. That isn't a bad thing, though. Everything is well-written, but I expect nothing less from Jurgens. Personally, I've been having an odd few weeks, and seeing Superman just save people and stand up to bullies was just what I needed. Sometimes you just need that escape from the real world for 15 minutes or so, and this issue delivers that perfectly as well as an interesting installment to the current story arc. On a side note, Superman grabbing the leaders of the opposing sides of a war and forcing them to come to reach peace is an appreciated reference to Action Comics (Vol. 1) #2. Art - 4: Superman looks fantastic here. There are just so many great images of our favorite Kryptonian charging into battle with grace and style. There's a one-page splash that I would love to have as a poster. Bogdanovic does awesome for the most part and Jurgens' breakdown art is superb. The colors are gorgeous and easy on the eyes. If I had to make a complaint, Bogdanovic draws some faces a little odd. The most notable instance is Jon. He just looks a bit odd. It's not enough to ruin the issue, but it is something worth mentioning. Cover Art - 3: Don't you do it, DC. Don't you go dragging Jon into your "Angry Eyes of Anger" trope. We're still trying to drag Superman out of that nonsense. I do, however, appreciate the image of Jon and Superman flying together. The colors are bright and it warms the heart seeing the two do father and son things. I understand the need for the thematically darker image for the lenticular cover, but I find the use of heat vision to convey Kryptonian anger a tad clich�. Regardless, the images are drawn well and I think the coloring looks great for both images. It's also kinda funny seeing Jor-El shooting one beam of heat vision. I know his other eye is damaged from implanted pieces of Krypton, but it's funny nonetheless. 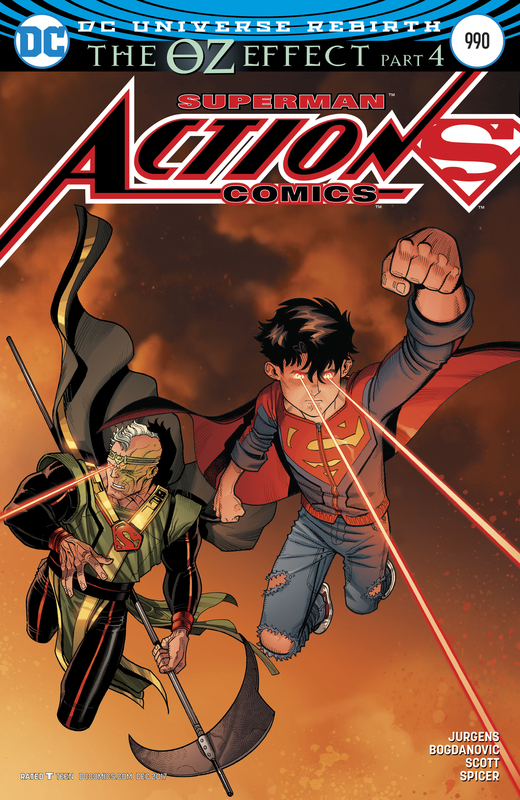 Variant Cover Art - 2: Jon and Jor-El are well drawn, but the cover just feels so uninspired. There has to have been something more visually striking to do this cover. Yeah, the art looks nice, but it isn't striking. It doesn't entice me to spend an extra three dollars to buy a second copy of the issue I've just bought. Variants should be something special. Ideally, the image should be something you wouldn't mind owning a poster of. The variant isn't necessarily bound to the contents of the issue, allowing for some creative and gorgeous imagery. This cover could have been so much more.